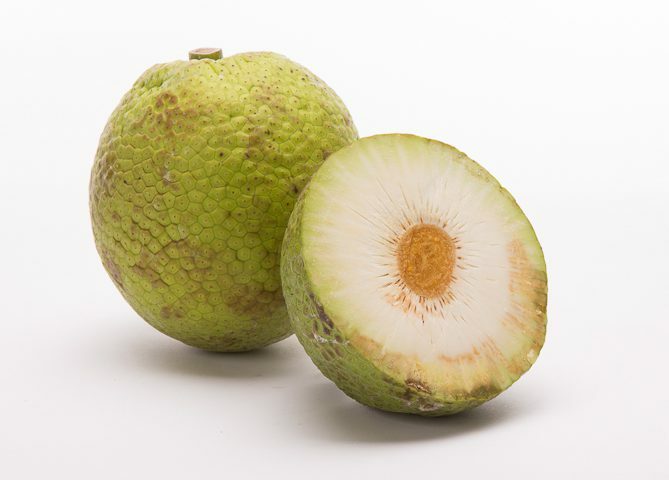 Breadfruit is round, green and bumpy with a white fibrous pulp. When fully ripe, the fruit is soft with an interior cream colored or yellow pasty. 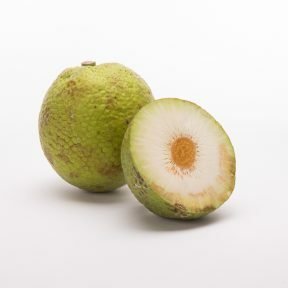 Breadfruit may be eaten ripe as a fruit or underripe as a vegetable or in the traditional Pacific Islander fashion it can be baked or roasted on fire. The fruit has a starchy texture and fragrance that is reminiscent of fresh baked bread. Names: breadfruit, fruta de pan, fruyapa, Guapén, penpen, semilla de pan. Handling: Mature breadfruit can be boiled, steamed or baked and replace potatoes in many recipes. Sliced breadfruit can be fried to make chips or French Fries. To cook breadfruit, twist off the stem and turn the fruit upside down to allow any sticky latex to drain out. Do this a few hours prior to cooking the fruit. The easiest way to steam or boil breadfruit is to cut it into quarters, remove and dispose of the hard central core, and place the piece’s skin side down in a pan with some water. The edible skin is easily removed once the fruit is cooked. Varieties: Whiteheart, Ma’afala, Ulu Fiti.